(PhysOrg.com) -- Climate change wreaked havoc on the Earth’s first rainforests but they quickly bounced back, scientists reveal today. The findings of the research team, led by Dr Howard Falcon-Lang from Royal Holloway, University of London, are based on spectacular discoveries of 300-million-year-old rainforests in coal mines in Illinois, USA. Preserved over vast areas, these fossilized rainforests in Illinois are the largest of their kind in the world. The rocks at this site - in which the rainforests occur - contain evidence for climate fluctuations. 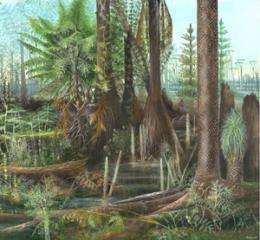 During cold ‘ice ages’, fossils show that the tropics dried out and rainforests were pushed to the brink of extinction. However, rainforests managed to recover and return to their former glory. Dr Falcon-Lang, from the Department of Earth Sciences, worked with colleagues at the Smithsonian Institution and Illinois Geological Survey. In their paper published in the leading journal Geology, they show that rainforest species all but vanished at the height of the ice ages. Yet they also reveal that the coal beds that formed shortly after, as the climate warmed, contain abundant rainforest species. Falcon-Lang said, ‘These discoveries radically change our understanding of the Earth’s first rainforests. We used to think these were stable ecosystems, unchanged for tens of millions of years. Now we know they were incredibly dynamic, constantly buffeted by climate change’. The research may also shed light on how climate change will affect the Amazon rainforest in the future. Dr Falcon-Lang commented, ‘If we can understand how climate shaped rainforests in the distant past, we can infer how they will respond in the future. We’ve shown that within certain limits, rainforests are resilient to climate change; however, extreme climate change may push rainforests beyond a point of no return’. The work is part of a five-year project funded by the UK’s Natural Environment Research Council and aims to study how climate change affected the Earth’s first rainforests. These ancient rainforests date from the Carboniferous period, 300 million years ago, when most of the world′s coal resources were formed.